My friend Catherine makes this carrot cake for her family’s birthday parties. As soon as the kids finish theirs and run off to play, the adults move in for seconds, and also have been known to zero in on the half-eaten slices left behind by the children — it’s that good. For a variation, substitute Chinese five-spice blend for the cinnamon and nutmeg. Make the cake: Preheat oven to 350 degrees. Butter three 9-inch round cake pans and line the bottoms with circles of parchment paper, then butter and flour the paper and pans. Using an electric mixer, beat together the sugar and oil in a large mixing bowl. Add eggs, one at a time, beating well after each addition. In a separate bowl, whisk together the flour, baking powder, baking soda, and spices, then add to the sugar mixture. Stir in grated carrots and mix until combined. Make the frosting: Beat together the cream cheese, butter, and vanilla with a stand mixer or an electric handheld mixer until blended. Gradually add the powdered sugar, sifting it over the butter mixture, beating until the frosting is smooth and creamy. Frost the cooled cake. 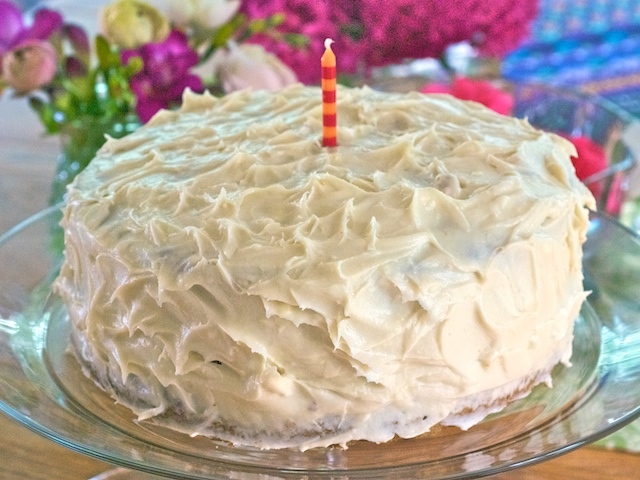 Culinate editor's note: For 14 to 16 cupcakes and frosting, halve both the cake and frosting recipes. Bake the cupcakes at 350 degrees for 20 to 22 minutes, then cool on a rack before frosting.